The main purpose of an archaeological dive log is to get a record of any work done underwater on a wreck site. The form is similar to a log for sports diving but is different as the emphasis is on writing down what was achieved and what was seen. The aim is to write down everything that was done or was seen as often you don’t know what details are important until later on. Download the Dive Log form here. The dive log is part of the primary record of the work done on the site and should be kept as part of the archive. The log form can be scanned and kept as an electronic file. A single form should be used for each dive but only one form is needed for a buddy pair of divers. x is the number given to each pair of divers. The names of the divers on the dive being recorded. 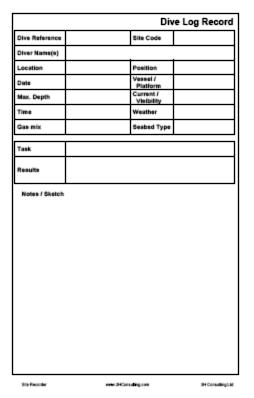 Do not include the divers on other dives as they will have their own dive log forms. The name of the place the dive was done, such as Tinker Shoal. The position of the start of the dive as a latitude and longitude. If the dive was on a known wreck or the position was not known then leave this blank. Describe the seabed starting with the most common first, such as reef with sand gullys, sand and reef, flat sand, silt and seagrass. Use this area for sketches of things found, small maps or any additional notes or comments. Its better to write down everything as something you have seen may not have been seen by anyone else.